Get the party started quickly and efficiently with this convenient chair dolly. 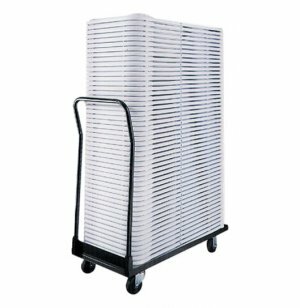 These chair carts can transport up to 26 wooden folding chairs at a time for easy setup and cleanup. They are built for easy navigation with four wheels and a large handle. These chair dollies protect your wooden folding chairs from damages that result from carrying chairs back and forth without a proper place to put them. They also offer a convenient storage option. Chairs can be rolled into your equipment closet on chair carts for space-saving storage, and simply rolled back out when they are needed. 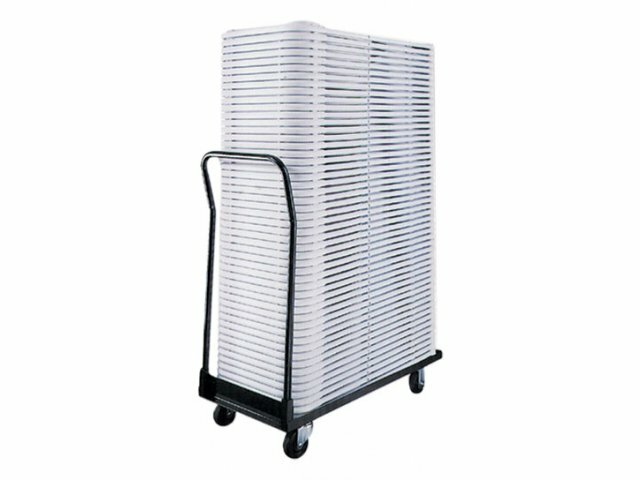 High Capacity: These carts can hold up to 26 WFC-333 White Wedding Folding Chairs. Smooth Steering: The large handle and easy-roll wheels facilitate smooth navigation while maintaining balance. Convenient Storage: Chairs can be stored in a folded position while resting on these convenient carts.